Most affiliated friendly societies told stories about how their history went back into the deep and distant past. They said that the present members were only following in a long tradition. New members had to learn the secrets of the society and the meaning of the stories and songs they heard at meetings. They had to learn how to recognise and greet other members. They were honour bound to join the membership on walks and parades, funerals and other special events. On ordinary days members could wear a badge in their lapel to show their affiliation. But when they paraded, they could wear a whole array of special gear - hats and cloaks or sashes and aprons - and they marched behind a banner, the bigger the better. Because so many people were investing in affiliated societies, the government began to take an interest. 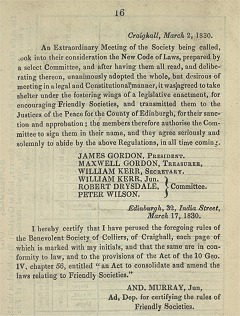 First they passed Friendly Society Acts, that tried to make sure that people's money would be safe. Then, late in the 19th century, the government started thinking about pensions and benefits for everybody. Because millions of people were already in friendly societies, the societies were picked to provide the first official sickness benefits after the 1911 National Insurance Act came into force. So even more people joined. But, after 1945, the government decided to nationalise benefits - it created the Welfare State and civil servants took over almost all the areas that affiliated societies had made their own. Soon there was no real reason to join. People were more sophisticated and felt the rituals and special gear were old fashioned and childish. So the last members got older and societies got smaller. Branches disappeared and even whole organisations were wound up. 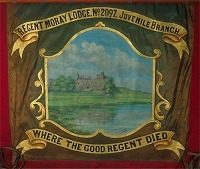 Nearly 30,000 friendly societies closed and only a few, a very few, survived into the 21st century.